At the new Wario Park theme park, there are four roller coasters to ride, hosted by Wario and his friends. On each roller coaster, you have to play through a series of microgames that use the DSi Camera. The camera shows a silhouette of the player's head and hands. Move your head and hands in order to complete the five microgames on each roller coaster and receive your surprise at the end. Wario's microgames require intense movement, and at the end, you are shown a looped recording of all your movements. Mona's microgames finish with you photographed with silly stamps over the top. Jimmy T's microgames make you pose so at the end you look like you're trying to fit into a photograph with the rest of the cast. Kat & Ana's microgames require two people to play. 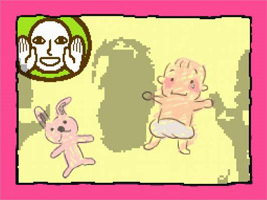 The game began as an experiment with the camera packaged with DS Face Training, and was originally intended for a full retail release. Early prototypes included the player using their finger to complete the microgames, such as by creating a bridge. Problems with the camera led to unconventional ideas, such as being packaged with a finger glove and black mat to improve the camera sensitivity. The developers found it difficult to put together anything that worked. Intelligent Systems director Naoko Mori discovered from one of the programmers that the game only shows a silhouette, but the camera picks up all of the player's movements. The developers discovered that coming up with microgames to fit these "joke" endings made development run more smoothly. After successfully "tricking" Nintendo president Satoru Iwata with this sleight of hand, the game was greenlighted. However, due to the gimmicky nature of the game, it was decided that it would be kept short, and made a download for the DSiWare service. During the staff roll game you can pick up objects that add points to your score. One of these objects is a NES controller.